Join us for our next book club meeting on Thursday, August 29th, at 7:00PM at Alex and Natalia’s house in Madison [114 Oxfordshire Circle, Madison AL 35759] to complete our discussion of The Sexual Politics of Meat by Carol J. Adams [http://www.caroljadams.com/spom.html]. You can order the book online and we have some loaner ebook copies as well (just contact Huntsville Vegans, Mike, or me via email or message and be sure to provide us with your email address). Our book club discussions are informal. We begin with specific points brought up in the text, and then move to a general discussion of the issues. Don’t worry if you aren’t able to read the entire book before the meeting. We’d still love to have your company and hear your voice. – Turn Left on Gillespie Rd. – The address is 114 Oxfordshire Circle. 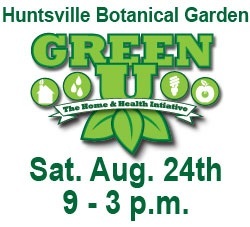 Huntsville Vegans will have a table at the Green U festival held at the Huntsville Botanical Garden on Saturday, August 24th, from 9:00AM – 3:00PM. We will be handing out literature on the effects of factory farming on the environment, giving out free food samples, and answering any questions on how to become vegan. We will have a team of three people staffing the table all day, but we’d love to have more members there to help hand out food, talk to interested passersby, and just have fun hanging out together. If you’re interested, please send us an email at huntsvilleveg@gmail.com or come to one of our Friday meetups at Cafe 153 @ Bridgestreet (near the Monaco theater) starting at 6:00PM. Can’t make it to Green U but want to make sure we have tons of vegan literature to handout? As a community group, we’re always very thankful for donations of vegan brochures to have available at events. We’ve ordered some supplies, but can always use more in case there is a larger turnout than we have anticipated. Donating literature is as easy as spending $5 for a bundle of 50 brochures and then dropping them off at our meetup or at the event itself. Stop by our table and say hi! Busy tables help draw other attendees in. If you don’t want to volunteer but will be attending the festival, please stop by our table and chat with us for a while.